Redfish is a term for a few species of fish that have a rose or slightly red hue. They are commonly found along the Atlantic coastline from the Caribbean Islands to Maine and in the Gulf of Mexico. The most notable varieties are Red Snapper, Red Drum, Rose Fish, and Acadian Redfish. The Acadian Redfish is the only one that actually has “redfish” in its name. As suggested by its moniker, Acadian Redfish is sourced off the coast of Maine. Each variety tastes a little different due to their environments, but the flesh is medium firm and great for smoking in your Masterbuilt Smoker. There are plenty of recipes for wet brining and then hot smoking redfish. This can work very well, and I encourage you to try it. I am partial to curing in a dry brine and cooking at a low smoke temperature. I think the flaky nature of the fish holds up well to a less aggressive brine that does not break down the flesh as much. And, a low and slow smoking method does not dry the fish out too quickly. I like this approach because smoked redfish is delicious right out of the smoker. If you are looking to preserve the fish to use in pates, dips, and as a cold appetizer, you may want to go for a hotter cooking technique and allowing the fish to cool down sufficiently. It will keep well in the refrigerator, sealed in a plastic bag, for days. This recipe takes some time to prepare. Most of that time the fish is doing all of the work and you can relax or whip up some tasty side dishes. Allow yourself a weekend to do this. It is worth the time to let the fish cure, dry, and smoke for rewarding results. 1. In a mixing bowl combine the 5 dry cure ingredients with a whisk to make sure there aren’t any clumps of sugar. 2. Place 1/3 of the cure in a layer in the bottom of a non-reactive baking dish (glass works best). Place one fillet, skin side down on top of the cure and press down lightly. Press another 1/3 of the cure into the flesh of the fillet. Place the second fillet of fish on top of the first, flesh side down. Pack the remaining cure on top of the fish and around the sides of the fish. Cover the dish with plastic wrap and place in the refrigerator for 8 to 12 hours, or overnight. 3. Remove the fish fillets from the dish and rinse under cool running water. Pat the fillets dry with paper towels. Place the fillets, skin side down on a rack inside a sheet tray. Place this in the refrigerator for 2 to 3 hours to allow the fish to air dry. 4. Take the tray out of the refrigerator well before you prepare your smoker, approximately 45 minutes. There may be a filmy layer on the flesh. That is a good thing. This is called the pellicle. It helps to keep the moisture inside the fish while it cooks. 5. Preheat your smoker to between 120˚F and 170˚F (lower if you have time to kill). Add mild wood chips to the side tray and water to the bowl with a few lemon slices added to the water. Open the top vent. 6. Place the fillets, skin side down, on a smoker rack. Smoke for 1 hour. Check the internal temperature. You are looking for approximately 140˚F to 145˚F. Continue smoking until that temperature is reached. Replenish water and wood chips as needed. This may take 2 to 3+ hours low and slow depending on the temperature of the smoker. So, go make some sides. Smoked fish can be served either warm or at room temperature. I think it is really fine as an appetizer served on toasted baguette slices with a little pickled horseradish smeared on the toast and a squeeze of some lemon. When served as a main meal component, it goes nicely with sweet and sour dishes. A pickled beet salad is a perfect accompaniment. A roasted potato salad can round out the meal. 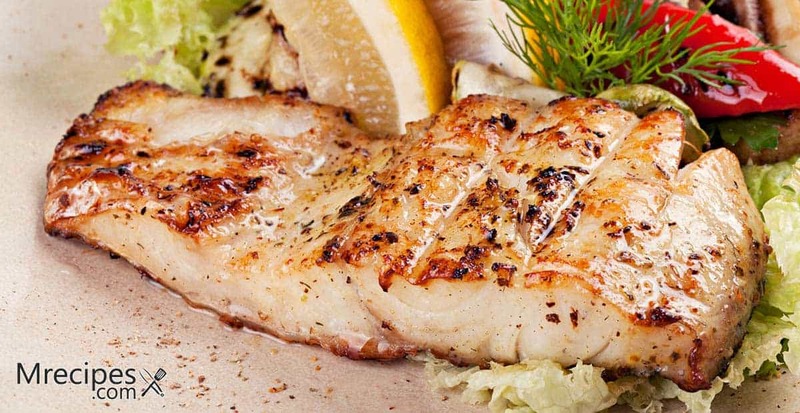 A dollop of horseradish and mustard cream sauce is nice on top of the fish along with a lemon slice. below is a very simple beet salad recipe that you can make the day before you smoke the fish. I have also included a super easy sauce recipe. Make the potato salad while the fish is smoking. Here is a nice roasted potato salad recipe from The Food Network. You could also make this salad with smoked potatoes. 1. Cut off the leaves of the beets approximately 1 inch above the beets. Clean the beets in cool water very well. Place the whole beets in a large pot and add enough cold water so that the beets are covered by 2 inches of liquid. Bring to a boil, lower to a simmer, cover, and cook until fork tender. This will take approximately 25 to 30 minutes. Drain the beets in a colander in the sink. Allow to cool before handling. 2. In a smaller sauce pan bring the vinegar, water, sugar, and salt to a boil and heat through until the sugar and salt dissolve. 3. Trim the tops and bottoms off of the beets, and peel the beets. Slice into rounds and toss in a large bowl with the onion slices. Pour the vinegar/sugar mixture over the beets and onion and stir to coat completely. Cover and refrigerate overnight. 4. Serve with the smoked fish and roasted potato salad. 1. In a small bowl mix the cream, horseradish, and mustard. Season with salt and pepper. If including, place the capers on a cutting board and smash gently with your knife just to break open. Stir in the capers and about a tsp of the liquid from the jar. Be frugal with the amount of salt if including the capers. 2. Serve a small amount of the sauce on top of each portion of the smoked fish, or on the side.